Writing a Certified Public Accountant (CPA) bio is a great way to advertise your services and connect with new clients. To stand out from the competition, you need a bio that gets your message across clearly. The key is to focus on what you can do for your potential clients, and what makes you uniquely qualified to handle their accounting business. 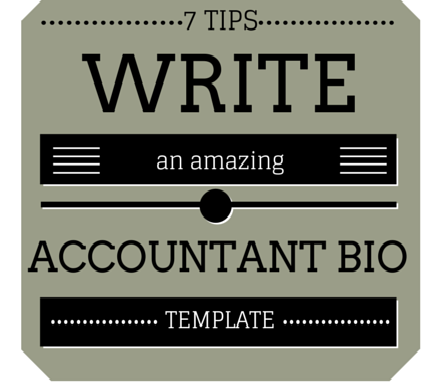 Here are seven key tips to help you write an effective CPA, CA or other accounting professional biography. Grab your client’s attention by bringing their interests into it right from the beginning. They want to know what you can do for them, so begin by answering that question. What makes you uniquely qualified to help them? There’s no one formula for this, but open with your name and then jump right into a short, engaging sentence that sums up why you stand out from the crowd. _____________ (your name) is a/an ____________ (your professional designation, e.g. Certified Public Accountant; Chartered Accountant; Certified Internal Auditor; Controller; Chief Financial Officer) and a/an/the ____________ (your position title, if different from your professional designation e.g. owner; founder; President; Principal; Staff Tax Preparer; Taxation Department Head) at __________ (name of company or organization), a/an ___________ (description of your company or organization, e.g. full-service accounting firm; tax practice; accounting consultancy; private equity audit firm) in _____________ (location). Traditionally, professional biographies are written in third person (as though someone else is talking about you). With the advent of social media there is a trend toward shorter, less formal bios, especially on social networks such as Twitter and Facebook. However, for an professional accountant or company bio third person is more appropriate because it conveys a more professional impression. If you’ve forgotten the difference between first-person and third-person voice, here’s a short refresher: Instead of writing “I am” and “I graduated”, write “Jane Smith is” and “She graduated”. Use your full name (first and last) the first time. After that, it’s up to you whether to refer to yourself by your full name, just your first name, or just your last name. When listing your expertise and education, focus on how your credentials can benefit your client. Don’t assume your credentials will speak for themselves: your potential clients don’t necessarily understand everything about your job or what you can do for them, so it’s your job to inform them in terms they will understand. For example: ______(your name) can help your company ______(accomplish an important goal, such as make decisions about allocating resources) by _________ (using relevant skills or experience, such as providing assurance about financial information). There are lots of accountants out there, but only one of them has your unique set of experiences, skills, and qualifications. Think about what sets you apart, and focus on your strongest, most relevant, and most unique skills. Chances are, your client is skimming a lot of bios, so make sure you stand out by using memorable details. For example, you might focus on your area(s) of specialization, your many years of experience, or your exceptional education, depending on what is most relevant and impressive to the clients you are trying to attract. _______________ (your name) earned his/her __________ degree from the University of __________ and his/her ___________ (name of professional designation, e.g. CPA, CA, CGA) from ____________ (designating body, e.g. the Institute of Chartered Accountants of Ontario). He/She is also a/an __________ (additional designations, e.g. Civil and Criminal court-appointed accounting expert). When you write your accountancy bio, break the information into short paragraphs (no more than three sentences in each paragraph). Studies show that when people are faced with a large block of text (especially on a computer screen), they just skim over it quickly. By making your paragraphs nice and short, you’ll increase the likelihood that people will actually read your bio. Whenever possible, use action verbs that focus directly on what you have done or can do. Avoid passive voice, which not only makes your writing wordier but often means you’re taking your customer out of the action. If that happens, they’ll quickly drift away. Passive voice: Our accounting company was involved in the conducting of major audits. Active voice: Our accounting acompany conducted major audits. In your conclusion, speak directly to your potential clients. Make sure they walk away with a clear message about what makes you uniquely suited to help them. For example: Contact _______ (your name) today to get started ________ (accomplishing an important goal) at _______ (phone number and/or other contact info). Again, the key to writing a strong bio is staying focused on what you can do for your client. Remember, although your accountant biography is written about you, it’s written for your client. Include your skills and qualifications, but always link it back to the client’s needs and interests.